I think the most interesting aspect of consciousness is the phenomenon of qualia, which is what it feels like to experience something (aka "subjective experience"). When philosophers talk about qualia, the canonical example of a quale is the "redness of red". Color perception in general amazes me. Specifically, I find it astonishing that my eyes and brain can take a multi-wavelength photon stream and generate such chromatic riches. How my brain makes the seemingly arbitrary mapping from physical wavelength to perceptual color fascinates me. To be clear, this is not the age-old question of whether the red I see is the same as the red you see - that is unanswerable without a way of really getting inside each other's minds/consciousnesses. Rather, the question I'm interested in is, how does the physical, objective quantity of a wavelength distribution couples with eyes and brain to create the perceptual, subjective quality of color? When a cone in your retina absorbs a photon of light, it sets off a chemical reaction that results in an electrical signal (among other things). This electrical signal is transmitted to other neurons in the eye, which relay them out of the eye into the brain. Your perception of color is believed to happen when your brain compares the signals coming from the 3 different cone types. For example, if more long wavelength photons are hitting your eyes than medium wavelength photons, the color will look more red than green. And if more short wavelength photons are hitting your eyes than the medium and long wavelength photons combined, the color will look more blue than yellow. This is the common theory for how wavelengths result in color perception. This common theory is all fine, but it doesn't seem to be very precise. So I was interested in getting a more specific grasp on the wavelength to color transformation. If I see an object reflecting photons of an arbitrary distribution of wavelengths, exactly what color will I see? Lucky for me, in the early 20th century researchers did experiments with people where they asked them to mix monochromatic lights (e.g. 450 nm which looks blue, 550 nm which is green, and 600 nanometer which is red) until they matched a target color (say, an orange color). Using this data and a method I don't fully understand, they were able to develop "color matching functions" for the "ideal human observer". Using these color matching functions and an algorithm described here, I made a web-app which answers my question. Namely, if an object reflects light of an arbitrary set of wavelengths, what color will I see? Feel free to play around with it. 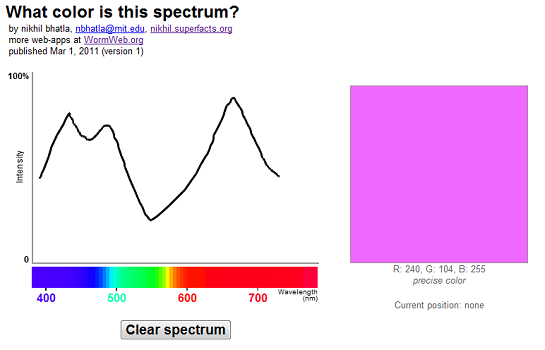 All you need to do is draw a spectral distribution on the graph, and it will show you what color you would see if you saw that spectrum. It won't be completely accurate because each person's computer screen has different color light sources (i.e. the red, green, and blue in your computer screen might be a different color than the one in my screen). But it should give you a rough idea of what to expect. I find it to be a lot of fun to just draw random shapes and see what colors they become. Sometimes it's really unpredictable. Note that sometimes it will say "approximate color" instead of "precise color" underneath the color swatch when you draw some spectra. That just means that the color is out of the color range that the screen can display, so it's displaying the closest color instead. In the future, I may modify the app to include some new features. One idea I had was to have the app work in the opposite way, in that you would give it a color and it would give you several spectra that would produce that color (these are called "metamers"). This could be useful if you have 2 or 3 single wavelength light sources and want to produce a specific color (or the closest approximation to that color). Another idea I had was to allow you to enter math functions that would draw on the plot and produce a color. So you could answer a question like "What color is an exponential function with a time constant of 4?" or other equally dorky questions. Anyhow, that's what I've got for now. Hope you play around with it and enjoy it! Feel free to leave any questions or comments below. - Graphic of cone absorbances is from Bowmaker & Dartnall 1980 - Visual pigments of rods and cones in a human retina - Full text. - I am super-grateful for John Walker's website without which it would have been much more difficult to make this web-app. Is it possible that color perception is a learned phenomena? Just as humans acquire language, which in turn alters their sensory intake, can the perception of color also be something that develops early on? I understand that linguists argue that language acquisition is facilitated by innate structures in our brain, that no doubt have evolved concurrently with our language systems. I am curious to know what color perception is like in babies or small children. Maybe they can experience a richer, more continuous spectrum of color than us as they have not yet learned the basic terms that both extend and limit our perception. The precise color resulting from light of arbitrary wavelengths may indeed be the result of shortcuts taken by our brain on the road to perception, like filling in a missing note of a chord. The spectrum is richer than that which our brains have the ability to perceive, and so it makes a close approximation based on what we're used to. This comment is much more broad than your above experiment, and one that is weighed heavily by speculation. Still curious though. Hmmm. Qualia is a fascinating subject. I've loved to think about the mistery of qualia, but I have never approached it in physical terms like you. I've tried to discribe it more abstractly(mathematically). Reading your blog post, some ideas came to my mind. 2) Colar perception in babies or small children might be hard to study, because they cannot talk well. However, there are studies on blinded adults who had cornea transplanted. Since their color perception is not yet polluted(?) and they can describe what they experience, it is a better approach I think. 3) Taking the evolutionist approach, we can think that "The spectrum is richer than that which our brains have the ability to perceive", because it is not efficient use of mental resource for survival and reproduction to perceive the whole spectrum. This is a really nice app. I am interested in teaching about color perception as a collorary to thinking about light spectra, using Benham's Illusion as a trigger for the investigation. Specifically, I am interested in exploring if we can find variations in how people perceive the illusion pattern. Thanks!